5,5,5 - 5,4..........Alex von Kleinwaldheim. 5 - 5...................Amsel von Hagenstolz. 5 - 4...................Armin vom Dornberg. 5 - 4...................Gitta von Romberg. 5 - 4...................Buna vom Dijkschen. “This powerful black male was imported into Sweden by Mrs L. Edström at the age of 5 months. Bryan was a big male with a good head and correct body. 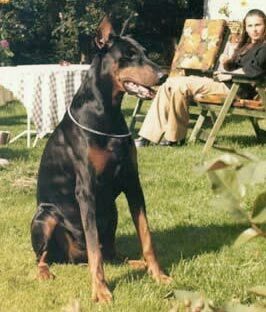 He was the son of Vello von Fürstenfeld, a dog whose value as a stud dog was first recognised by Mr E. Wilking, Chairman of the German Dobermann Club, breeder and judge. The “B” litter proved him right. Bryan improved the quality of the breed in Scandinavia. He also produced some excellent progeny in Holland and Germany by artificial insemination. One of his sons Guys Hilo von Norden Stamm became an influential male. Don Dayan: SchH 1 and sire of the van Le Dobry “A” litter (Hertog Alpha); van't Smeulveen “C, D, F, H, I, P, Y” litters (Candy, Festus) and vom Franckenhorst “K, L” Litters (Lord Dayan, Lothar). Della: dam of the dei Piani di Praglia “M” litters (Medina). Guys Hilo: SchH 3 and passed the ZTP with 1A rating for character and V for conformation plus winner of numerous show titles. He is sire of the von Langenhorst “A, B” litters (Ali, Amboss, Assi); vom Eschenhof “O” litter (Orpheus); vom Stadtwald “K” litter (Kim); van Diaspora “C” litter (Caecilius), vom Franckenhorst “N” litter (Nimrod Hilo) and Doberhill “E, M” litters (Black Marco). Gravin Grazie: passed the Swedish Körung plus winner of numerous show titles and dam of BryanStam's Gräfin Graziedotter. Anuschka Bryansdotter: winner of numerous international show titles and dam of the von Hagenstern “P, U, S, W” litters (Panco, Pamela, Uschika). Great Ginnie (S10732/71): dam of the Kårdholmens “B, D, F” litters (Bonnie Texdotter).